There are various actions and events that trigger a sync between HubSpot and Salesforce. HubSpot also checks for new information that needs to be updated across your HubSpot and Salesforce accounts every 15 minutes, and a sync is triggered as needed. Form submission by a contact. Marketing email is sent to/opened by/clicked on by contact (if sync is enabled for that activity). Sales email is sent to/opened by/clicked on by contact (if sync is enabled for that activity). Meeting is scheduled with a contact (if sync is enabled for that activity). Call is made to a contact (if sync is enabled for that activity). Note is created on a contact record (if sync is enabled for that activity). Sales document is viewed by contact (if sync is enabled for that activity). Task is created on a contact record (if sync is enabled for that activity). Contact/company/deal property value is updated in HubSpot (subject to field mapping update rules). Lead/contact/account/opportunity value is updated in Salesforce (subject to field mapping update rules), unless the value is in a Salesforce formula field. Please note: while updated values in a Salesforce formula field will not trigger a sync, an updated value in a mapped Salesforce field that is part of a formula will trigger a sync. New Salesforce lead or contact is created (subject to your Salesforce integration settings). New HubSpot contact is created (subject to your Salesforce integration settings). If you're using a Salesforce inclusion list, any HubSpot contact (new or existing) added to your inclusion list will trigger a sync. Addition of a lead or contact to an active Salesforce campaign via a HubSpot form submission. Changes to lead/contact ownership in HubSpot or Salesforce. Lifecycle stage transitions (if the Automatic lifecycle stage transitions setting is enabled). Contact lists and individual contacts, companies, and deals can be manually synced to Salesforce. don't meet any validation rules that you have set up in Salesforce. If a HubSpot contact meets the sync criteria, check the Salesforce Sync card in their contact record for errors. 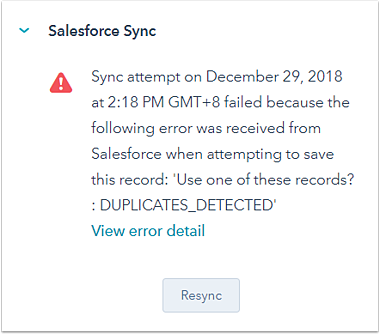 The Salesforce Sync card will display any error(s) preventing the contact from syncing to Salesforce. Click View error detail for more information on what the error is and how to resolve it. Learn more about common Salesforce integration sync errors. Learn how Salesforce accounts sync to HubSpot as companies and how Salesforce deals sync to HubSpot as opportunities.